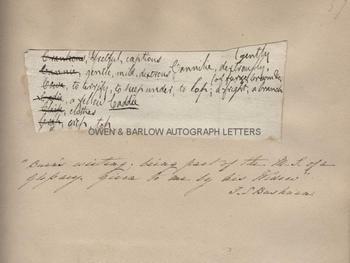 Manuscript entirely in the hand of Robert Burns, being part of a glossary of Scottish dialect words. The irregularly shaped paper piece, measuring approx. 5.75 x 2.25 inches (15 x 6 cms), is of stout, laid paper commonly used by lawyers or government offices and is probably Customs and Excise paper, which was often used by Robert Burns. The dialect words are not listed in alphabetical order but all begin with the LETTER C and each has an English translation adjacent to it. Words include Crankous, crannie, caddie, claik, etc. 8 dialect words, together with their translations, making a total of 35 words in Burns' handwriting. Other examples from this glossary are known, including a fragment in the National Library of Scotland (The Cowie Manuscripts). It appears that after the poet's death, his widow cut the manuscript into such pieces and gave these to persons who had requested a memento of her husband. In fine condition, laid down on part of a leaf from the 19th century album of Miss Shapter, a daughter of the Exeter surgeon, Thomas Shapter, best known for his book on Cholera and his early researches into epidemiology. A note on the album leaf in Miss Shapter's hand indicates that the fragment had been obtained by a Mr. Bushman and gives its provenance as "Burns's writing, being part of the M.S. of a Glossary. Given to me by his widow. J.S. Bushman".